Lucha Loco @Duxton Hill (Singapore) | Get Your Grub On! After a while I finally came back to ‘Lucha Loco‘ for a friend’s farewell party. 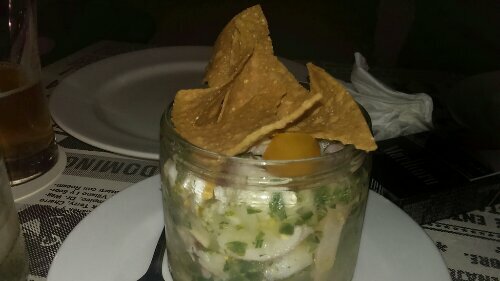 For starters I had the ‘Ceviche de Camarones y Pulpo‘ a fantastic refreshing dish full of fresh and sweet prawns and octopus. The texture of the octopus was amazing and just on the spot, firm without being chewy and the lightly sour taste of the lime juice together with the cilantro and herbs made this simply delicious. My favorite non-taco dish here. 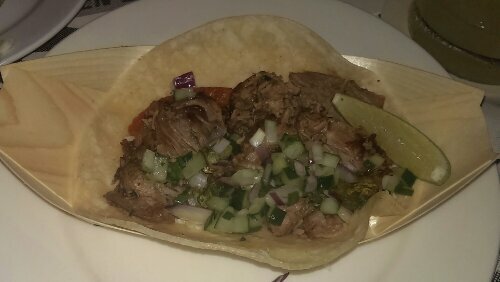 For my taco selection this time I went for one of their specials, the ‘Taco de Barbacoa‘ with lovely tenderly braised lamb meat that was juice and strong in taste. 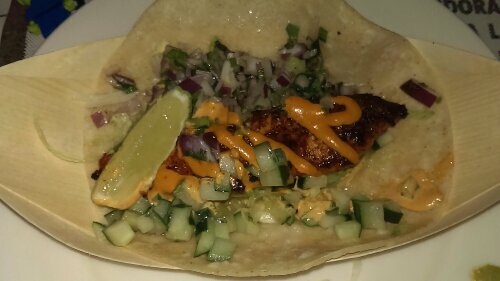 A great taco but I would have wished for some more mint in the salsa as it nearly disappeared between all the the other flavors. By default I had the delicious ‘Taco de Carnitas‘ but this time I also ordered the ‘Taco de Pescado‘ which I didn’t have for a long time. It usually is a little bigger than in the picture but my colleague stole a piece from this nicely grilled snapper before I could stop her. The smaller size didn’t change anything, it still tasted great. The fish was moist and slightly charred on the outside and the combination of the freshness from the salsa and the spiciness from the chipotle made this work perfectly. Another dinner much and well spend with great food, strong drinks and an outstanding friendly service. Still my kind of place, thanks a lot.